You are here: Home / Cleaning Tools & Chemicals / Pool Clarifiers and Flocculants: what’s the difference?! Pool owners want to keep their pool clean. They know just like you or I that no one wants to be swimming in a filthy swimming pool. For those who are familiar with swimming pool sand cleaning, you should know that there are plenty of chemicals you can use to clear up your pool when you are just opening it for the season or clearing it up from a week off. Algae tend to grow when the pool is inactive, and using these type of chemicals can make your pool that much clearer. There is a significant difference between pool clarifiers and flocculants, and it’s important to know which one is best for you when deciding which chemicals to use for your swimming pool. There is a lot of potential for your pool to get cloudy and dirty…. quick! So you are going to want to purchase something that will clear up your pool at a rapid pace, so you, your friends, and family can hop in! Swimming pool clarifiers are chemicals that produce coagulation. In other words, they take the smaller particles and combine them into a larger particle so that it would be easier to be obtained by the pool filter. The swimming pool clarifier and the pool filter go hand and hand. They work together in order to eliminate unwanted particles from your swimming pool. When using this method, particles tend to head straight towards the filter, rather than become large and sink to the bottom of the pool. Since these functions work together as a team, it is crucial that your pool filter is on when applying the pool clarifier to your pool. If you apply the clarifier and your pool doesn’t clear right away, keep the filter running every hour of the day until it becomes clear. Keep in mind that this process puts a lot of pressure unto your pool filter so if you have a broken or worn out filter, you might want to consider purchasing a new one sometime in the future in order to have an efficiently filtered swimming pool. The Robarb Super Blue pool clarifier efficiently clears cloudy water and reduces the chances of pool water becoming cloudy at a rapid pace. 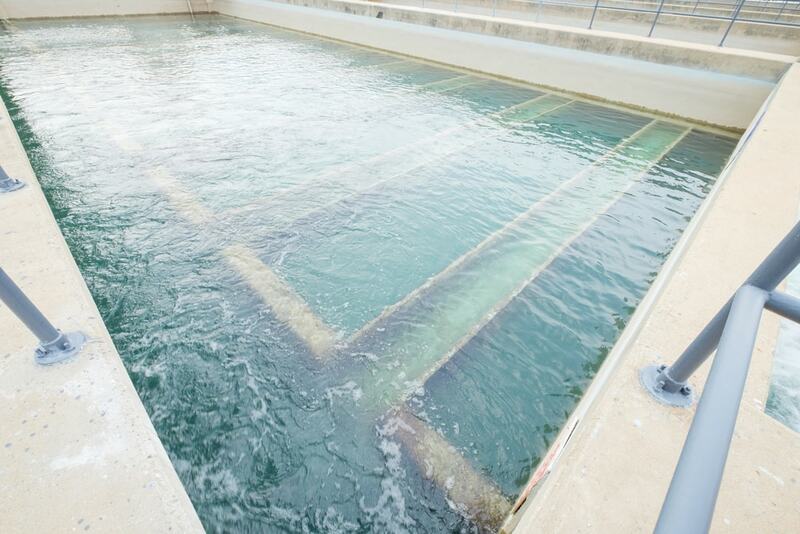 This concentrated formula treats every 5,000 gallons of water with as little as an ounce of clarifier. With 32 ounces of clarifier inside one bottle, you can clean a lot of water without constantly going back and forth to the pool store looking for more products. In addition, this clarifier works with all pool filters, so you won’t have to worry about your filter being clogged after a few uses. If you can wait a full day or two, you should definitely use this product. It will take whatever debris you have in your pool and send it straight to the filter; a pretty easy process once you get the solution in the water. Similar to pool clarifiers, swimming pool flocculant grabs particles and brings them together. The difference is that Swimming pool flocculant takes particles grouped together and sinks them down to the floor of the pool. This way, the pool is no longer cloudy, dead algae is no longer present, and the flocculant makes cleaning that much easier since all you have to do is vacuum the floor of the pool. In other words, rather than using the pool clarifier to attract all the particles to the filter. Using pool flocculant, there is no need to chase around particles throughout the swimming pool. When applying the flocculant, make sure to run your pool for at least 2 hours before so that it will be able to blend in with the water and make its’ effect. After running the pool for a few hours, let it sit idle for at least 8 hours. After doing this, you should wake up ready to work with a swimming pool that is ready to be vacuumed. If, for whatever reason, your pool isn’t necessarily “clean” by the time you initially vacuum it, try vacuuming again once the particles settle back to the bottom of the pool. The Aqua-chem flocculent is the ideal solution to get if you want a product that will clump up all your debris and sink it to the bottom of the pool. 8 ounces of this product treats about 10,000 gallons of water, so you may, or may not need more than the two-pack that is provided to you upon purchase. This product will clear your pool in a quick manner, leaving you with the responsibility of vacuuming the floor to guarantee a 100% cleanse. To simplify the effects that the Aqua-chem flocculent provides: it gathers all objects; particularly debris such as leaves, dirt, and grass, takes them as a whole and sinks them. At this point it is up to the person working on the pool to vacuum everything up from the floor, otherwise all debris will remain there. The difference between swimming pool clarifiers and pool flocculant is quite simple. If you have some time and don’t really want to do much work, then go with the pool clarifiers. Flocculant brings all debris and particles together and sends them to the bottom of the pool. All you have to do manually is vacuum the floor of the pool. The clarifier essentially does all the work for you, but takes a toll on your filter after a while and potentially takes longer compared to the flocculant. If you don’t mind doing some vacuuming, the flocculant is the way to go. With either product, you are bound to have a cleaner pool. Both the pool clarifier and flocculant are designed to settle dead algae, clear cloudy water, and compose debris that would then be removed depending on which option you decide on.